This is the last will and Testament of me Thomas Stabb Stipendiary Magistrate Bonavista Newfoundland. I devise and bequeath all my Estates and effects real and personal which I may die possessed of or entitled to, unto my wife Annie Stabb absolutely. Witness Francis R(?) Kough Witness R.K. (? )Forbes M.D. 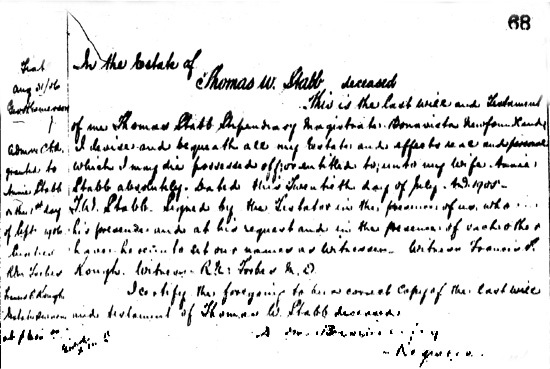 I certify the foregoing to be a correct copy of the last will and testament of Thomas W. Stabb deceased.